The disproportionately large mouth of the horned frog (Ceratophrys sp.) has earned the frog the descriptor "pacman" frog, after the video-game yellow orb with gnawing maw, Pac-Man. Three of the eight horned frog species that hail from South America – and one hybrid form -- are common in the pet trade. Part of these frogs’ appeal is that you can house them in various ways. Pacman frogs are voracious, so be sure to house them individually to avoid interspecies predation. For new keepers or those with large collections, a simple approach is best. Use a plastic storage box container with 1 square foot to 3 square feet of floor space and an opaque lid. Provided that your home is in kept in the low- to mid-70 degrees Fahrenheit, no supplemental heating or lighting is required. Use a few damp paper towels for substrate and a few pieces of cardboard for each frog to hide under. When the frog defecates or otherwise fouls his cage, simply throw away the paper and cardboard pieces, rinse out the plastic box and replace the paper towels and hides. 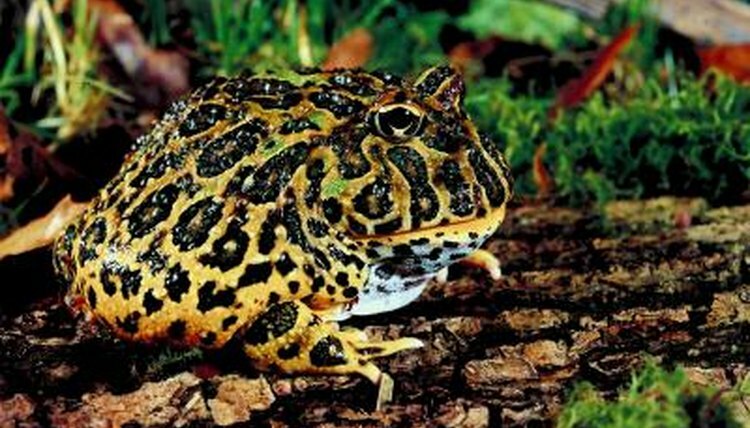 Some keepers and breeders combat dehydration by keeping pacman frogs in plastic boxes permanently flooded with about one-quarter to one-half inch of water. The water level should not be higher than the frog’s mouth. As with the husbandry of all amphibians, use only dechlorinated or bottled spring water. The water must stay very clean; every time your frog defecates, urinates or is fed, you must change the water. You can use gravel on the bottom of the habitat to create a sloping topography that allows the frog to climb to dry land, but this is not necessary. It is important to use gravel large enough that the frog will not swallow it, and to keep the gravel clean. If you would like your pacman frog to live in a slightly more natural looking cage, use a 10-gallon aquarium with a screened lid, and cypress mulch, orchid bark or organic topsoil for the substrate. Keep the substrate damp but not wet. Use some ceramic props like hollow rocks and log halves to provide easy-to-clean hiding spaces. Ensure the substrate is either too big to ingest or harmless if ingested; otherwise you'll want to move your frog to a smooth surface for feeding. Ingesting the substrate is a bigger concern with small frogs than large ones. Add a small, shallow water bowl and be sure to clean it as necessary. Pacman frogs will thrive in naturally planted terrariums, but that approach requires more labor to maintain. Use a 10- or 20-gallon aquarium with a screened lid and – if you want the habitat lit -- fluorescent lighting, which won’t add much heat to the cage. Place a 1-inch gravel drainage layer down, and top it with 2 to 4 inches of organic topsoil. Plant a few shade-tolerant plants like golden pothos (Epipremnum aureum) directly into the soil and cover the ground with some green moss. Add a few cork pieces for hiding spaces; install a small, shallow water bowl; and it is ready for your frog. Mist the habitat daily with amphibian-friendly lukewarm water.